Essex County’s largest city is also the ninth largest municipality in Massachusetts. That city is the exceptional City of Lynn. Situated in eastern Massachusetts, Lynn is a commercial and urban manufacturing center on the Atlantic Coast just nine miles north of Boston. Culturally diverse and densely populated, Lynn is known for its gorgeous historic architecture, lush open spaces, phenomenal parks, vibrant downtown, and numerous attractions. 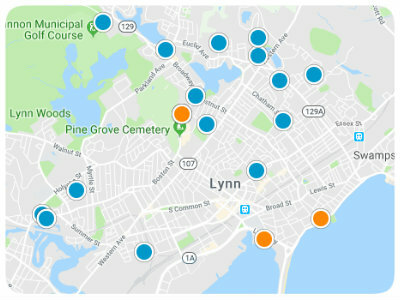 Points of interest in Lynn include Manning and Fraser Fields, Lynn Auditorium, Gannon Golf Club, the 2,200-acre Lynn Wood Reservation, and Pine Grove Cemetery, among many others. For all these reasons and dozens more, Lynn is a fabulous place to buy a home. If you are a prospective homebuyer considering the available real estate in Lynn, and you have furry friends, here is another reason to love this city: the Barkland Ave Dog Park. This seasonal wonderland is a must-visit pet destination off Parkland Avenue. To enjoy the park dogs must be registered, however, registration is easy at the City Clerk’s Office. To obtain a license, you must complete a waiver, be a resident, and have an up-to-date Rabies Certificate. Cats do not require licensing and do as they please, which is fitting since that is what cats do best. Barkland has a unique L-shaped enclosure which affords pets the opportunity to run off-leash in fenced-in safety. This impressive 4,000 square foot park can easily accommodate dogs of all sizes and encompasses two separate enclosures, one 300-by-600 feet, and the other 60-by-100 feet. The park sits adjacent to a Public Works salt shed and is across the street from the historic Pine Grove Cemetery. There is convenient parking available in front of the fenced-in area. Additionally, “Wagging Tales” is Barkland’s unofficial newsletter which keeps pet families informed when the park is closed during the winter. The newsletter is usually published around the 10th of the month and includes pet tips, general information pertaining to canines, and other interesting things. If you are considering homes for sale in Lynn, and you have a furry friend, add Barkland Dog Park to the list of reasons why Lynn is a wonderful place to call home.